A bag of chips appears in this undated stock photo. Donuts, cookies, pastries, the candy dish, the vending machine and more -- are office foods making people fat? Perhaps. The first national study looking at what people eat at work and found that workers took in an average of 1,200 calories worth of food and beverages per person, per week. The foods they ate came from a variety of places -- the cafeteria, vending machines, common areas and even meetings and worksite social events -- and sometimes were even free. The study surveyed 5,222 employees across the U.S., asking what foods they got from their workplace during a seven-day period. Researchers found that a quarter of these employees, most of whom were college graduates, women and non-Hispanic whites, did get food and beverages at work. "Nearly one in four working adults obtained food at work during the week, and the food and beverages that they got added up to an average of nearly 1,300 calories, more than half the recommended daily calorie intake for the average adult," lead author Stephen Onufrak, an epidemiologist in the Division of Nutrition, Physical Activity and Obesity at the Centers for Disease Control and Prevention, told ABC News. "With employees spending eight hours a day on average at their place of employment, a lot of people may not be aware of all of the calories they get from work, especially from foods they get for free." Free food was the most common source of what people ate at work in the study, at 17 percent, versus those who purchased food at work, at 8 percent. The foods were seldom a healthy salad or included a side of veggies –- they tended to be processed, high in salt and included "empty" calories, things like pizza, soft drinks, cookies, brownies, cakes, pies and candy. 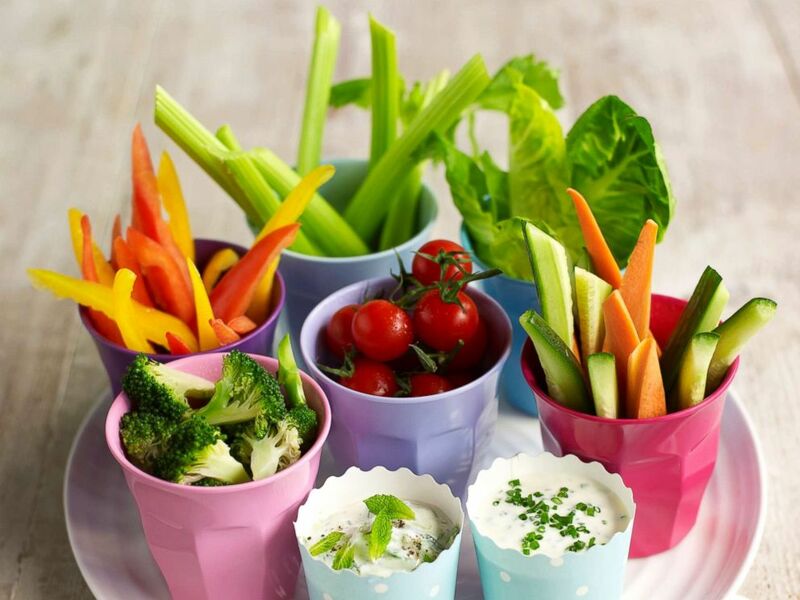 A plate of crudites and dips appear in this undated stock photo. The study suggested ways for workplaces to promote access to healthier foods, noting that changing employees' health behaviors has the potential to reduce both sick days and health care costs for companies -– added motivations to the public health concerns. Cafeterias could promote a salad bar over a pizza or burrito station. Vending machines could swap their cheese-flavored corn chips, at 250 calories with little nutritional value, for sunflower seeds that include healthy fats and fiber, at 160 calories. Listing calories, and nutritional content, on vending machine and cafeteria items could also help deter employees from eating some unhealthier items. Since a lot of the food items obtained by employees were free, employers may also want to consider promoting policies to encourage healthy food options. "Employers can encourage healthier foods at meetings and events, especially when the employer is providing free food to employees," Onufrak said. "Providing delicious, appealing, healthy food can also help to create a culture of health at a workplace." This study was limited in some ways, including that it was based on participants' memory of what they ate in a seven-day period. The findings have not yet been published in a peer-reviewed journal; they were presented by the researchers at the annual meeting of the American Society for Nutrition, the first week in June.